Proenza Schouler's PS1 suede satchel has been on my lust list for awhile, but at $1995, I won't be purchasing it anytime soon. Although this suede satchel from Gap has it's differences (making it more of an "inspired by" option), it will absolutely give you a similar style to the Proenza bag for a much lower price. It retails for $178 and you can use code "GAPSAVE25" TODAY ONLY to get 25% off your purchase, making it an even more affordable $133.50. Don't forget to use Ebates and you'll also get 8% cash back in your account! Click on the photo below if you're interested in purchasing. *Update - 12/13/10* - The Gap bag is no longer available but I did find another great option in faux leather from Mimi Boutique. This bag retails for $67 and you can click here to purchase. 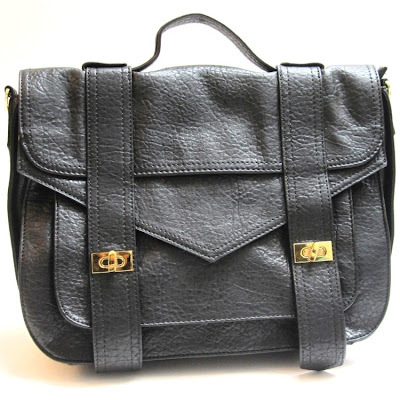 *Update - 3/2/11* - Mossimo has a fantastic look 4 less option of the Proenza bag, retailing for the low price of $34.99. It comes in grey (click on photo for more info), white, cognac, olive, and black (click on any of the images in the widget below for more information. I actually JUST bought the white one at Target on Monday night!!! The blk one and the camel one looked a little cheap but the grey and white were awesome....and 34.99??? great price! i'm going to target TONIGHT to buy this bad boy!